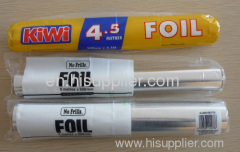 Aluminium Baking Foil is used for Wrapping, Cooking, Storing and Baking. Material: Aluminium Foil Alloy 8011 "O"
Length:5M--300M As per customer requirement for Houseuse / Foodservice,Catering Use. Width: 30cm/12" , 45cm/18", or other special size.